After the weekend’s activities concluded, Dr. Rubenstein continued his work in advancing podiatric interests. 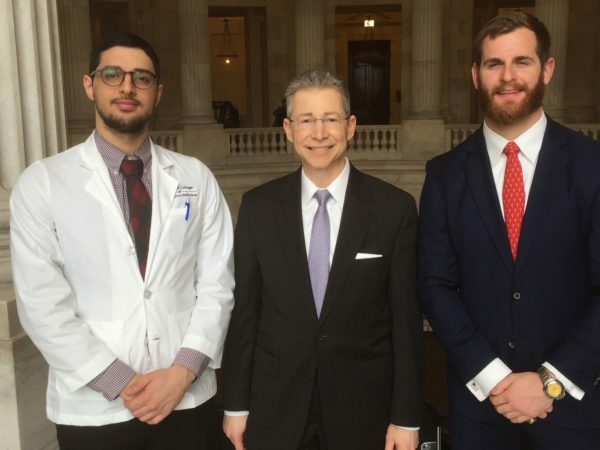 He, along with student doctors, lobbied Congress on Tuesday to ensure support and representation of podiatrists in the VA Provider Equity Act (HR 1058/S1871). Student doctors Milad Kashani (left) and Chris Dreikorn (right), and the newly elected Vice President of the APMA, Dr. Seth Rubenstein lobby Congress in Washington, DC. FASMA would like to congratulate all of the newly elected doctors and delegates, including our own Seth Rubenstein, DPM, and extend our gratitude to all members of the APMA’s House of Delegates who work tirelessly on the behalf of all podiatrists. This year’s 98th House of Delegates meeting of the American Podiatric Medical Association (APMA) in Washington, DC convened to vote on new officials of the House, the Board, and to plan and implement procedures and policies that will assist the advancement of podiatric medicine. Dr. Seth Rubenstein who previously served as the Treasurer, was elected as the Vice President of the APMA’s House of Delegates. The House of Delegates is the body of the APMA. Its purpose is to provide fair representation of the interests of podiatrists across the country and make policy recommendations to the Board. A separate Legislative Conference follows the House of Delegates to lobby Congress on issues of importance to podiatry and their patients. Drs. Michael Tritto, Todd Harrison, and Andrew Liss serve as the Maryland delegates of the APMA and Dr. Erika Schwartz represents us as the Washington, DC delegate. Dr. Tritto also serves as the Chair of the Resolutions Committee. 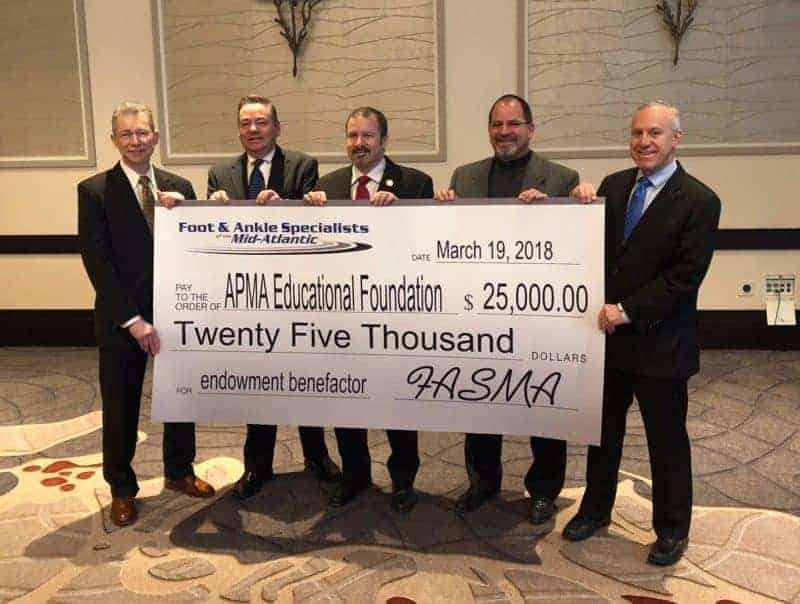 The Foot and Ankle Specialists of the Mid-Atlantic made a $25,000 contribution to the APMA’s Educational Foundation to establish a named endowment. The fund is dedicated to advancing and growing podiatric medicine through student scholarships, projects, and activities. This particular endowment will create a continuous $1,000 annual student scholarship for a 3rd or 4th year podiatric medical student.